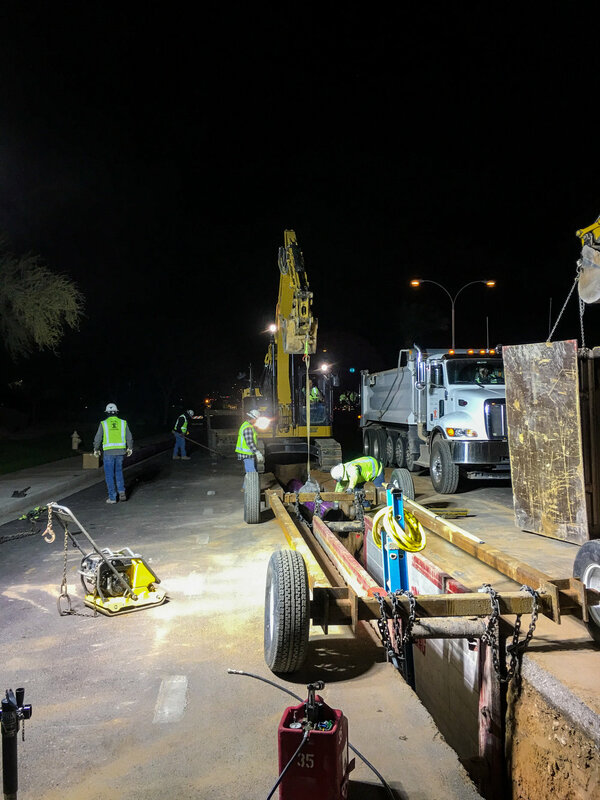 This project consists of two scopes of work: installation of a reclaimed water line and improvements to the north driveway of the Wells Fargo Chandler Corporate Campus. The water line installation includes approximately 5,300 LF of 16” along Price Road between Queen Creek Road and Germann Road, and east along Germann Road. The driveway improvements include roadway, sidewalk, and landscape modifications to accommodate a new signalized intersection and crosswalks that will connect the two corporate buildings on the east and west sides of Price Road. The entire project includes 4,200 SY of asphalt pavement, 1,650 LF of curb/gutter, 1,400 SF of valley gutter/apron, 3,800 SF of concrete sidewalk and landscape improvements.